Darlene Nemeth: Are You Super Woman? I wonder just how many wear the super woman cape. I know this syndrome has become epidemic. Once we decide to wear that cape, we develop an unknown kinship with all the other women who have chosen the same. We have a common thread that binds us. Until I started searching the internet - blogs - I felt alone. I never really stopped to think I could reach out. I was so caught up in my own struggle, consumed by emotions and running around trying to get everything done that I couldn't even fathom that there were other women doing just the same. Now I am amazed how I could think that way. It’s true, I run from one problem to the next, trying to do it all from dawn to way past dusk and one day melts into the next and I don't know what day it is and I can't remember what day I did what. My mind is always full with thoughts whirling around making my heart race and the butterflies swarm. I miss appointments or forget to make them in the first place. I can't remember my own list of things to do but I am expected to remember everyone else's list too. In the morning, I jump out of bed and look at the clock. I am going to be late, but I am lucky. I get to go to work. Which brings a whole slew of different situations to address. I am also lucky to have my Mom. She is a God send. She arrives and starts the dishes from last nights supper. She gets my three year old Hunny Bunny dressed and gets her breakfast. Lately I have just enough time to pop my meds and run out the door. My husband is usually up way before me. He goes out for a coffee and comes back. He paces the house waiting oh so patiently for me to jump into my car. His car is not drivable. That is another story. Just as I am ready to walk out the door he remembers he needs to take his meds. I wait patiently at the door. Don't want to set him off. So he drops me off and picks me up from work Monday to Friday. It is frustrating not having my car available just in case but I make that sacrifice so he isn't stuck in the house ranting and raving at our teenage daughter. Many days his auto pilot tries to take us some place else so I have to point to our cut offs or he misses them. His mind is somewhere else. Doesn't seem to matter that we have taken this route hundreds of times, I still have to ask him where are we going? He drives so slow that I feel another anxiety attack hitting me hard. I am late and I just want to hurry up and get to work. He lights up a cigarette and I follow his lead. We usually have two smokes by the time I arrive at work. On a good day we don't argue in the car. Although when he is pissed off with me he drives faster and I get to work sooner. Arguments in the car are quite the norm. So much so that it is a trigger for me. I can’t stand getting in the car with him. I am trapped. He has even made a joke of it. I can’t escape and I am forced to communicate with him. I have to listen when diarrhea of the mouth hits him. Most times I don’t get sucked up into his episodes but there are times that I can’t stop responding to his hate and anger with the same. What do we fight about? I don't know. Anything and everything. Stupid things. He knows I want him to open his window when smoking in my car. I don't want it caked with nicotine and reeking like an ashtray like his car. Yet he can't seem to do this one small request. He's too cold. He forgot. Did he forget that he is supposed to love me and cater to my every need? Oh yah, my mistake, it is the other way round. Okay so I am at work. Guess what? He has to call me. And call me. And call me. Why? He just wants to talk. He has to talk to me about something important. He wants to know if I saw that watch-a-ma-call-it. He calls to ask if I am busy. Of course I am busy. I am always busy. I am at work. My teenage daughter often cooks supper. Now she does. For the last few weeks anyway. Otherwise nothing. I'll make Kraft dinner. Or we have cereal. Or plain spaghetti with sauce poured from the can. Actually we can't afford anything fancy like hamburgers or pork chops. There for a while we all forgot what meat looks like. We eat a lot of pasta. After supper I like to spend time with my four year old granddaughter, my Honey-Bunny. Before I know it, it's bath time. Then relax and watch a movie with a bedtime snack. Moving quickly along to bedtime, story time and lights out time. By ten o'clock she is sound asleep. Now I can chose what to do. Should I watch a movie? Check my email? Blog? Clean? Spend time with my teen aged daughter? What about my husband? All of the above? I wish! And now it is three o'clock in the morning again. How did that happen? I should go to bed but I am not done yet. The super woman cape is crazy glued to my shoulders and stapled for good measure. I am craving time for myself. It is an itch that never gets scratched enough because if I take the time to really scratch, yes everything would fall apart. It is exhausting. How long does it take for a super woman to burn out? Sounds like the start of a joke. How many newfies does it take to change a light bulb? One to hold the lightbulb and four to turn the house. Just when I think I just can’t keep doing this, I find the strength to carry on. I look at my husband , daughters and granddaughters and remember what it is all about. They are my purpose. My strength. My life. My love. I ask myself, do I really want to remove the proverbial cape? I need to know more about the “super woman” syndrome so I search it on the net. As usual there is not much information out there. I found a hub by Cari Jean titled Superwoman Syndrome. You can follow this link if you would like to read it. Having read this, I am not so sure that I am a superwoman. Or am I in denial? Maybe I am a knock off and not the real thing? This sort of sounds like me. Now this does not sound like me. At least I don’t want to think I am because those reasons listed aren’t really admirable. Oh, okay, I will admit I am a people pleaser and I have a hard time saying no. Plus I strive for perfection. There. I said it. I am Super Woman. What about you? 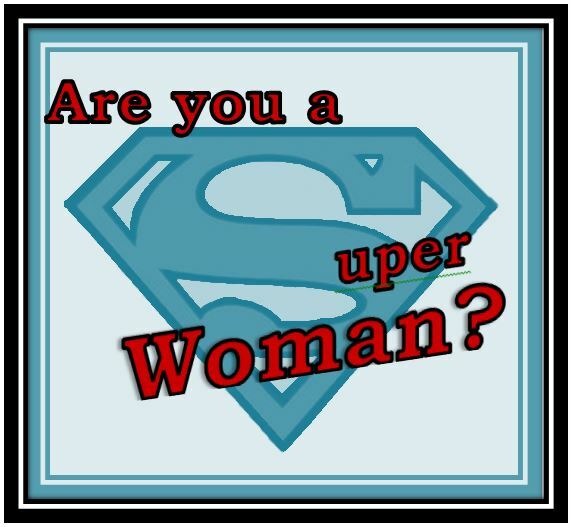 Are you a Super Woman too? The first step is admitting you have a problem. What is the next step? I hope you find this post helpful or at least amusing! Let me know what you think by leaving a comment. I can never get enough of those. :) And if you know someone else who may enjoy this post, please share it with them. Due to a large amount of SPAM on my blog, I will not be publishing any comments submitted by Anonymous. I apologize for the inconvenience. I would love for you to subscribe and follow along! I also post on Twitter, Facebook and Pinterest. See you there.